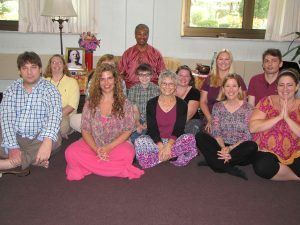 Welcome to our Shaktipat Meditation Retreats! The purpose of Shaktipat Meditation is to turn your mind within in order to experience your true nature. In The Yoga Nityananda approach, you are taught a unique, proprietary method to have the direct experience of unsurpassable Bliss. This allows you to adjust your life accordingly. You are taught how to experience and express the Joy of the inner Self at all times. Our Shaktipat Meditation method is taught by Sadguru Kedarji. Students experience that it is the easy means of curing the restless mind. You will find that it also invokes healing and tremendous wellness. This begins with the experience of Witness Consciousness. Witness Consciousness is a state in which you can observe your thoughts and all the activity taking place in the moment, passively. This occurs through an expansion of your spiritual awareness that we refer to as witnessing awareness. We call this the easy means. The many arduous practices of Yoga, extensive Pranayama, etc. are replaced with the spark that ignites the wondrous flame of true meditation. That spark is the Shaktipat Blessing, the full kundalini awakening transmitted by Sadguru Kedarji. You can learn more about the weekend Shaktipat Meditation Retreats. View The Weekend Shaktipat Blessing Retreat Schedule.